The most popular content on ABC7 News in 2017 ranged from heartbreaking to heartwarming. Here's a look back at some of the year's most popular stories. SAN FRANCISCO (KGO) -- The most popular content on ABC7 News in 2017 ranged from heartbreaking to heartwarming. Here's a look back at some of the year's most popular stories. It's being called the most destructive firestorm in California history. Small fires fueled by extreme winds merged into six massive fires in the North Bay, burning more than 200,000 acres, destroying 8,900 structures and killing 43 people. Click here for full coverage on the North Bay wildfires. A sign about the recent wildfires stands in a vineyard outside the Cline Cellars winery Monday, Oct. 16, 2017, in Sonoma, Calif. The beloved 'tunnel' or 'drive-thru' tree fell to the ground during a massive storm in the Bay Area that left rivers and creeks flooded, houses damaged and several thousand people without power. Calaveras Big Trees State Park volunteer Jim Allday says the tree went down Sunday and shattered on impact. He says the once-majestic sequoia is now a heap of rubble. Click here for the full story. A beloved part of California history toppled to the ground during a big storm in the Bay Area. In February 2017, in the midst of widespread rainfall, Oroville Dam's main and emergency spillways were significantly damaged, prompting the evacuation of more than 180,000 people living downstream in Butte, Yuba and Sutter counties. Click here for full coverage on the Oroville Dam spillway incident. Drew Tuma helped out everyone who was unable to snag eclipse glasses to watch the Total Solar Eclipse with this DIY video. Click here for the full coverage on the Total Solar Eclipse. Violent protests moved through downtown Berkeley night after the cancellation of a speaking engagement scheduled for controversial Breitbart editor Milo Yiannopoulos. Kiara Robles braved the crowd wearing a red "Make Bitcoin Great Again" hat in the style of President Trump's red hats, which made her and our crew a target. The video in the tweet below shows the graphic exchange between a protester and Robles, who was pepper sprayed. "I'm looking to make a statement by just being here and I think the protesters are doing the same. Props to the ones who are doing it non-violently, but I think that's a very rare thing indeed." She later told ABC7 News she was alright. Click here for the full story and click here for more stories about protests. There was an unmistakable sign of just how severe the affordable housing crisis is in Oakland. Sky7 was over the hundreds of senior citizens who stood in line, many of them overnight, for a shot at a waiting list for subsidized housing. Click here for the full story. Incredible video captured a rare sighting - an albino dolphin calf swimming in Monterey Bay! Click here for the full story. This photo comes from Ryan Hamilton, who was on a rooftop near Wrigley Field when he noticed a blind man trying to hail a cab for several minutes without success. As he continued to watch, a stranger walked up and asked the man if needed help. Hamilton said the young woman waited with him until one pulled up. As it all unfolded, Hamilton snapped a few photos and shared the sweet story on Facebook to "give her a shout-out." This Instagram photo from @vpiombo, shared using #abc7now, shows the "tunnel vision" while traveling into San Francisco. Click here to follow us on Instagram! 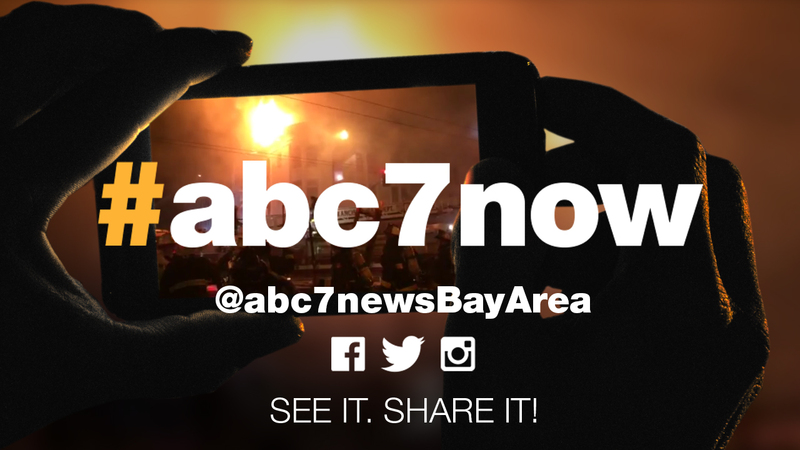 When you see news happen where you live, share it with us on social by hash-tagging your video and photos #ABC7Now. Click here to update or download the ABC7 News app now!